If it’s true that you can judge a man by the company he keeps then I reckon I’m up for some sort of global award. Everywhere I go I’m surrounded by insanely loyal friends, and even for the enemies I hurl mental rocks at I hold some deep-rooted passion. This weeks Reprint is a demonstration of all things friends. I’m not the photographer, in fact I found this photo on my phone after the three subjects snuck off to scramble around Nepal’s Annapurna Circuit. 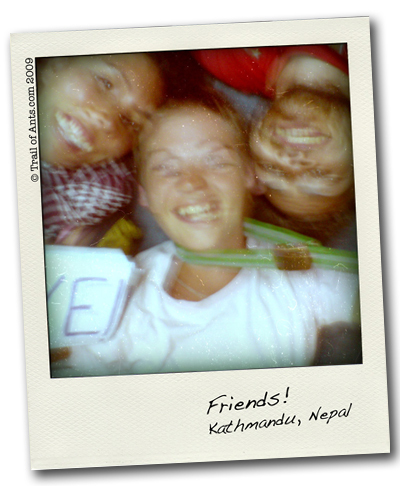 I’m not a great lover of trekking, therefore I asserted my god-given right to remain in the barmy city of Kathmandu. From left to right we have the inexplicably lovely Floridian, Sharon; the lover of my laneways, the holder of heart Miss Reb; and the mighty man of the Welsh valleys, the one and only Mark. Each of them can be seen wearing various articles of my clothing which they secretly extracted from my backpack and inexpertly captured this shaky image. Afterwards they proceeded to marvel at the amount of MySpace poses I had of myself in my phone’s memory. It was a social experiment. Honest.